USDA APHIS and the Massachusetts Department of Conservation and Recreation (DCR) are the federal and state agencies responsible for the eradication of the Asian longhorned beetle in Massachusetts. They also partner with other federal agencies, state agencies such as the Massachusetts Department of Agricultural Resources (MDAR), local city and town government officials, and other stakeholders in Massachusetts. Individuals and private landowners are also subject to these regulations. Movement of host materials and hardwood firewood outside of the Massachusetts regulated area is illegal, and fines may be assessed if businesses and individuals do not follow state and federal regulations. 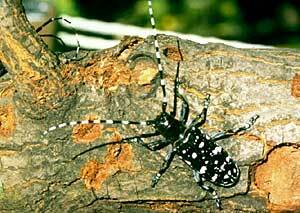 The Asian Longhorned Beetle (ALB) was first discovered in the United States in Brooklyn, New York in 1996. Subsequent infestations were located in Chicago, Illinois in 1998; Jersey City, New Jersey in 2002; Worcester, Massachusetts in 2008; and Bethel, Ohio in 2011. Thanks to the efforts of federal, state, and local cooperators, the infestations in Illinois and New Jersey have been declared eradicated along with a satellite infestation in Boston, Massachusetts (originally detected in 2010). Existing ALB infestations are currently being managed by federal, state, and local cooperators in New York, Ohio, and the Worcester regulated area in Massachusetts. Asian longhorned beetle has not been found in any other New England state. 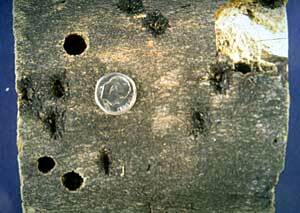 ALB is a wood borer that attacks live, healthy trees; its presence will lead to the death of the host tree. Homeowners and concerned citizens should be aware of its signs and report any suspicious findings immediately to the proper state or federal personnel. 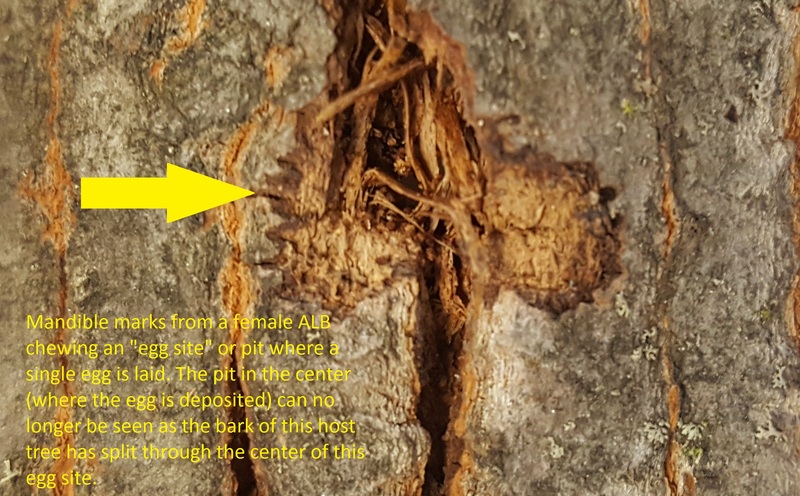 If you believe you have captured an Asian longhorned beetle or have seen damage caused by this insect, such as exit holes, on susceptible host trees like maple, please call the Asian Longhorned Beetle Eradication Program office in Worcester, MA at 508-852-8090 or toll free at 1-866-702-9938. 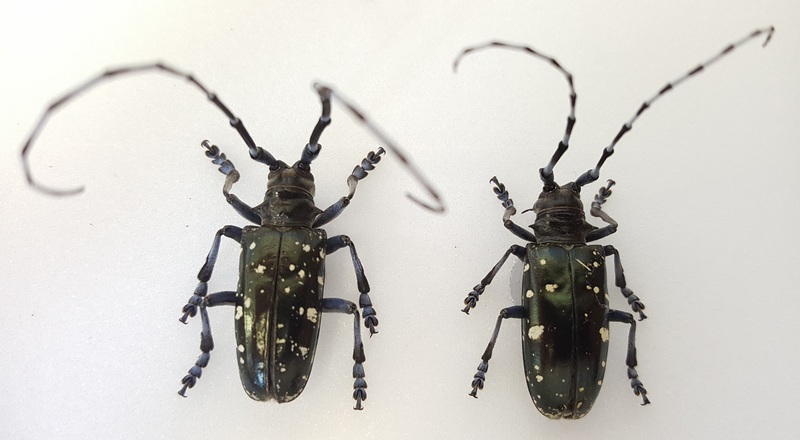 To report an Asian longhorned beetle find online or compare it to common insect look-alikes, visit: http://massnrc.org/pests/albreport.aspx or https://www.aphis.usda.gov/pests-diseases/alb. Asian longhorned beetle and other invasive, wood boring insects may be readily transported in firewood, live trees, and other forest products. This is why firewood cannot be moved outside of the Worcester regulated area and it is always a good idea to avoid moving wood long distances, purchase (and burn) firewood locally, and purchase kiln-dried firewood when at all possible. The adult beetle is approximately 1-1½" in total body length. It is a shiny black color that resembles patent leather and it has white spots on its back. The antennae are longer than the body of the males (female antennae may only be as long as the body) and each antennal segment alternates between white and black. In Massachusetts, adult beetles start to emerge from trees around July 1st and may be active into the late fall. 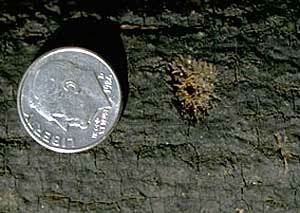 Female beetles will chew individual "notches" in the bark of trees and lay an egg in each of these sites. 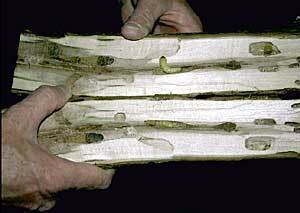 Larvae (immatures) soon hatch and feed under the bark by tunneling. Later, in the fall, they tunnel deep into the wood where they spend the winter. 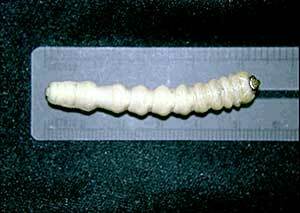 They pupate in late spring, after spending either 1 or 2 seasons tunneling in and damaging the host. 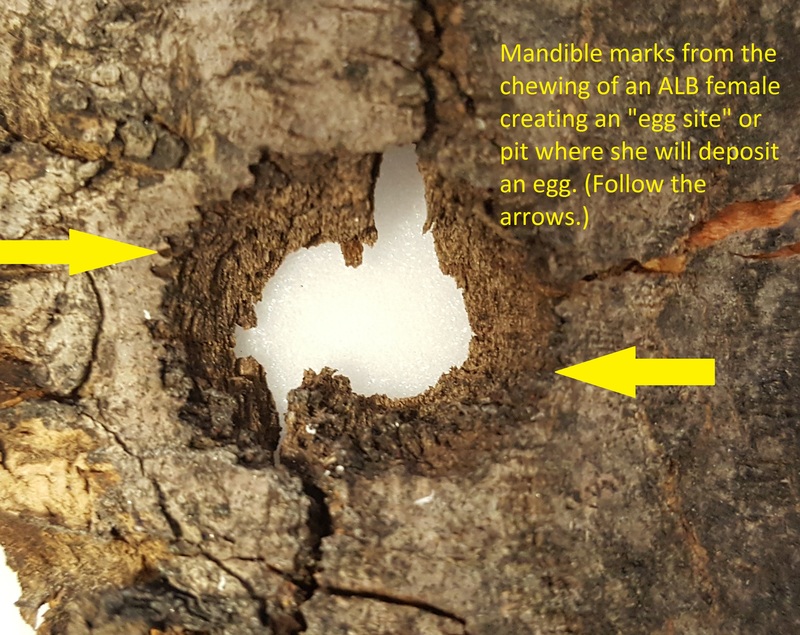 Round exit holes, created by the emerging adults, are about 3/8” in diameter; copious amounts of sawdust can also be seen on the ground or caught in the crotches of tree limbs at the time of adult emergence. 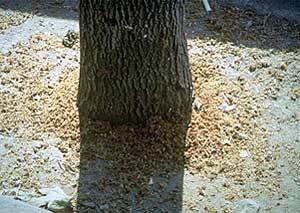 Multiple years of ALB infestation will eventually kill the tree. Revised by: Tawny Simisky, Extension Entomologist, UMass Extension Landscape, Nursery, & Urban Forestry Program with contributions from Jennifer Forman Orth, Environmental Biologist, MA Department of Agricultural Resources; Rhonda Santos, Public Information Officer, United States Department of Agriculture Animal and Plant Health Inspection Service; and Ken Gooch, Director of Forest Health, MA Department of Conservation and Recreation (DCR).